Android Reborn – WhatsApp is one of the most popular chatting apps for Smartphone. Almost all Smartphone users have WhatsApp account and use it. Besides chatting, it also allows you calling for free. Sometimes, you need to read WhatsApp messages without letting the senders know that you have read the messages. The simplest way is by reading the messages from notification bar or quick settings. 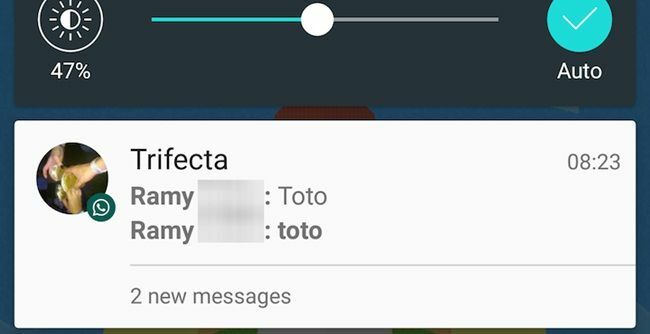 How to read WhatsApp messages in notification bar? It is very easy. Just follow the steps below. What you need to do how to read WhatsApp messages in quick settings is to go to Home Screen first. If you are playing a game or watching a video, juts pause it and go back to your Smartphone Home Screen. After you are on the Home Screen, it will show or display the messages or notifications from some apps on your Smartphone such as BBM, WhatsApp, Line, etc. Now, you can read the messages as you want. It allows you to read the messages fully but the sender does not know that you have read. It is very easy and interesting, is not it? That is all how to read WhatsApp messages on Smartphone notification bar without letting the sender know that you have read the messages. If you want another simple way, you can try this. Just activate plane mode or inactivate the data connection first. Then, read the WhatsApp messages manually. You can read the messages fully but the status is still unread. Unfortunately, it cannot happen on all types of Smartphone. So, the previous way is better. Hopefully this will be useful especially for WhatsApp users.